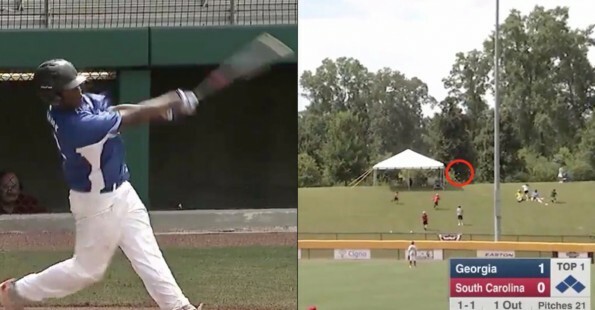 Though the walls in a Little League park are normally about 200 feet out from home plate, it’s clear that 13-year-old Jayce Blalock could probably stand to have them moved out a bit further. Playing South Carolina (and walloping them 14-1), the Georgia team had no shortage of runs scored. But the best one came in the form of this moon shot that would have cleared high school walls to be sure. Right as the announcer said “He could hit it into the trees,”…guess what he does?